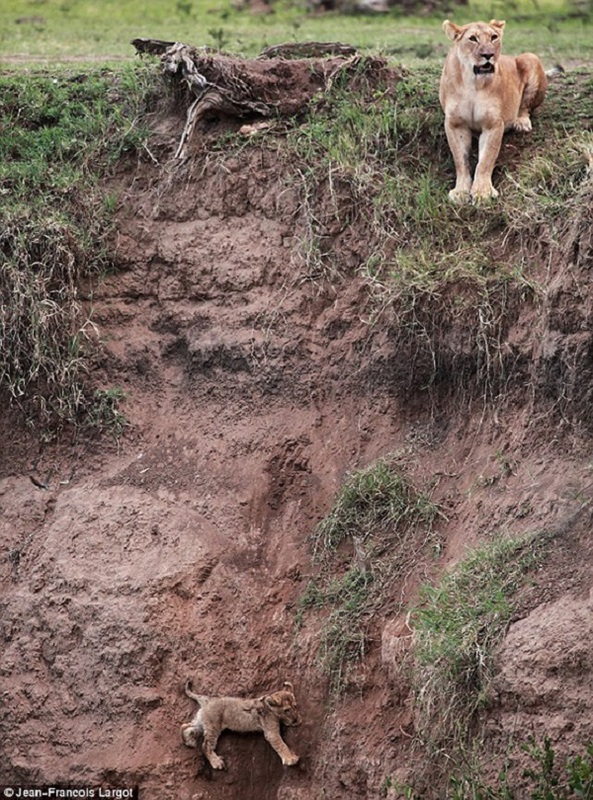 A Scared Lion Cub Slides Down Steep Cliff: Who Will Come to the Rescue? No matter where a mother falls in the Animal Kingdom, the instinct to protect their children is said to be incredibly powerful. You hear of mothers being able to lift cars off of their children, due to an extreme release of adrenaline, and the sheer will and determination to save their child. Unfortunately, we are also aware of stories of neglect and abuse, but the sad stories are far less than the ones of a mother’s love and determination to protect their offspring at any cost. And we must remember humans don’t corner the market on that love and those protective feelings. 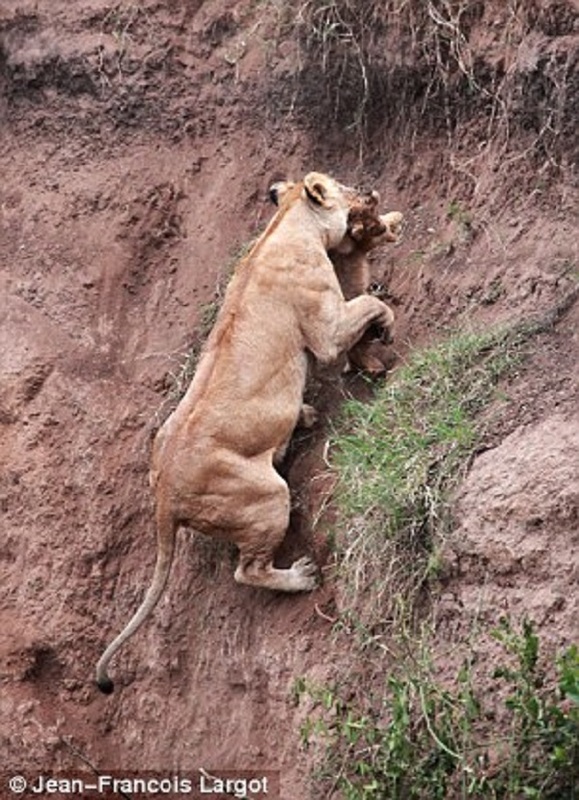 Here a baby lion (a cub) cries for help from the very steep and frightening side of a cliff. You can see the fear on the cub’s little face. And there is the mother lioness, looking distraught, at the top edge of the cliff, as she stares down at her crying, scared cub. The cub is in a very dangerous situation, struggling not to fall any further, while the mother and other lionesses evaluate the situation. 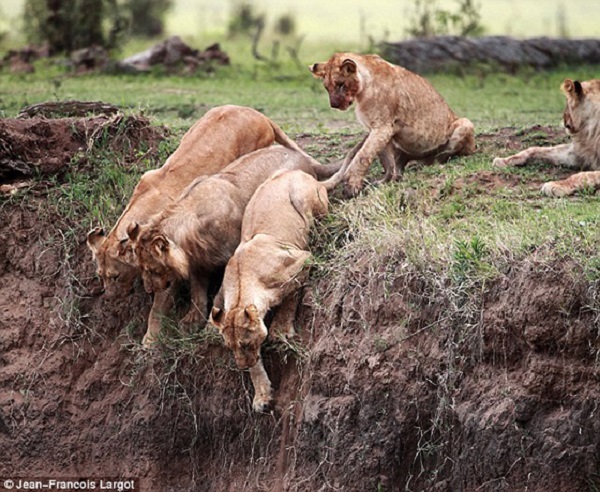 You can see three of them starting over the cliff toward the cub in peril. 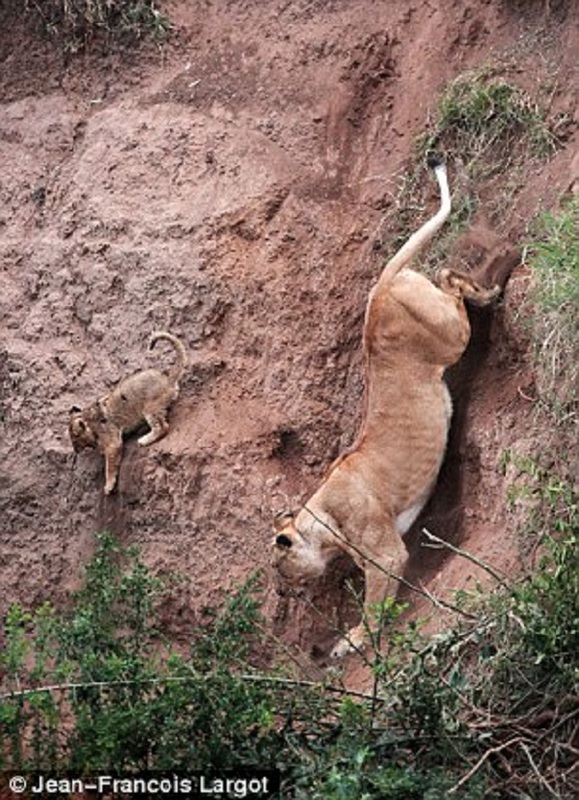 The cub’s mother manages to navigate her way down the steep cliff to reach her baby, but she still needs to reach him, as he slips in the dirt. 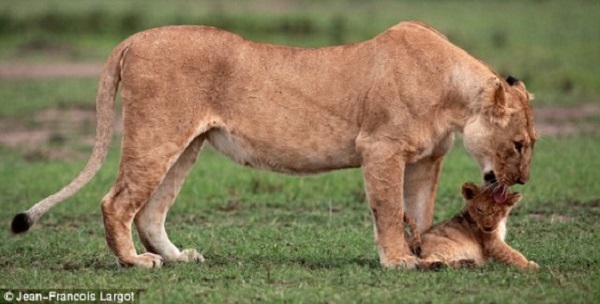 Mother lioness to the rescue! She has reached her cub, and has her baby safely in the grip of her strong jaw, but can she get them both back up the cliff to safety? She does it! PHEW! Safe and sound back on flat, solid ground, the cub looks relieved, as his mother gives him tongue kisses to show her love, and presumably comfort him. Lioness, dog, cat, hen, skunk, guinea pig, or human, the power of a mother’s love is amazing, and those of us who have been recipients of that love should cherish it. Those who are the mom’s with the instincts, love, and will to protect their children should be more appreciated. I am glad in this case, the mother not only protective, but was also brave and agile, and the cub was saved. Who doesn’t love a happy ending? Previous articleFather Discovers His Son is a Hero – This Will Melt Your Heart!